Product #20537 | SKU TF-2BE0500TFR | 0.0 (no ratings yet) Thanks for your rating! 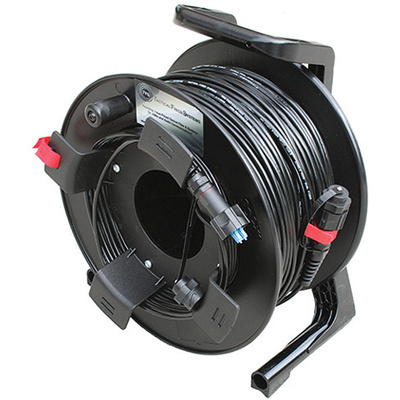 This 2-fibre, single-mode Tactical Fibre Systems Cable & Reel, 152 m in length, features TFS's DuraTAC stainless steel armoured inner core and TFS BullsEye anodised aluminium connectors. DuraTAC is TFS's solution to wear and tear that ultimately cuts through the Kevlar that surrounds the fibre cores in tactical cables. DuraTAC comprises a stainless steel armoured inner core underneath the Kevlar, providing protection against stepping, cutting, and rodents. Other than being stronger, DuraTAC cables are also about half as thin and half as light, so you get more cable on your reel. TFS BullsEye connectors are equipped with waterproof dust covers and together with the DuraTAC cable offer good protection against contamination and damage.